Simplifying equations is often the first step to solving algebra equations. Some methods that can be used to simplify an equation are Combine Like Terms, Multiplication & Division of Terms, Removal of Brackets (Distributive Property) and Cross Multiplication. The following diagrams show how to combine like terms to simplify an expression. Scroll down the page for more examples and solutions. Like terms are terms that have the same variable part i.e. they only differ in their coefficients. 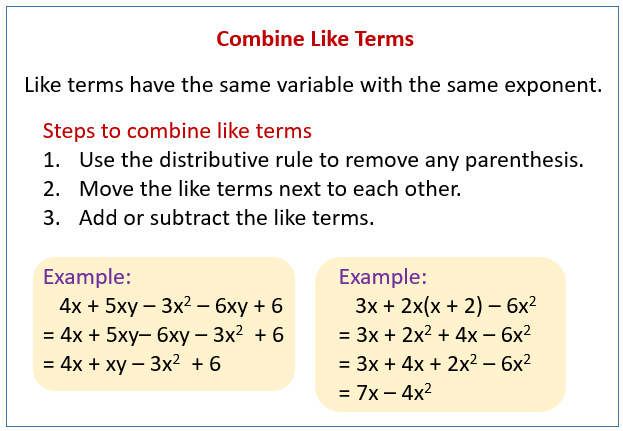 Combining like terms is very often required in the process of simplifying equations. How to Solve an Equation by Combining Like Terms? The coefficients and variables of terms can be multiplied or divided together in the process of simplifying equations. How to solve equations using multiplication or division? Sometimes removing brackets (parenthesis) allows us to simplify the expression. Brackets can be removed by using the distributive property. This is often useful in simplifying equations. How to Solve an Equation by the Distributive Property? How to solve fraction equations by isolating the variable using inverse operations? Have a look at the following video for more examples on simplifying equations. How to simplify and solve equations?